What Money and Set-up Is Required to Get Started? If there is one overriding thing to know before you get into freight brokering, it is this: you do NOT need to invest a lot of money to get started. Now, let me quickly say that you DO need to have sufficient funds to carry your personal living expenses until you get your business established. This is no problem for some individuals if there is another “go-to” person who has employment that takes care of the personal expenses. Let me also say that you DO need some type of cushion in your business to pay your trucks in a timely manner. Again, for some people, this is no problem because they have some type of savings they can rely upon. Without some type of savings for your cushion, some people apply for a bank line of credit or a term loan while others use a factor to sell their invoices. Using a factor means an individual does not need to undergo a credit check because the factor will invoice the shipper and will rely upon the shipper’s credit status. So, the bottom line is that you do NOT need $30K, $50K or $300K to get started. 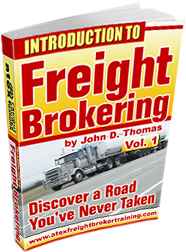 What this also means is that you do NOT need to invest in expensive freight broker software to get started. Why? Because even the best and most expensive software will NOT help you build your business. You need to build your business first. Freight broker software will help you manage your business once you get it established; but it won’t help you build your business. This is important: your primary focus will be to build your business which might consume the entire first year. If you know and understand this before you embark upon your new venture, you will be better off financially AND you will be more focused on the most important item which is: building your business. These expenses are in addition to training fees or the cushion to pay trucks. We do the applications together on these requirements above (except for the Home Study that you will do on your own with clear instructions).